Our team has handled every type of issue a garage door can develop. From major malfunctions like broken springs and malfunctioning openers to removing dents from your door panels, our technicians have the skills and experience to quickly solve any issue you’re experiencing. A common but frustrating issue that can be hard to fix is a door that’s broken free of the tracks. This will make your door impossible to use, and creates an additional security hazard. Our technicians can fix an off track door, but will also ensure that the original cause of the problem won’t occur again, whether this requires dent removal or a new set of tracks. A great way to enhance your home’s curb appeal is to upgrade your current door. A newer, more modern door can not only make your home look great, with plenty of attractive metal and wood options, it can also cut down on heating bills and improve your home’s security. Our team can guide you through the process of choosing the right door for your home, as well as supply and fit the new unit. In many ways, the most crucial part of the garage door is the drive system, whether that’s a screw, belt or chain drive type. It's the opener that is responsible for enabling the automation motion of the door, and any issues with it can be very problematic. Our team can identify the core issues and resolve them; our close links with major opener manufacturers like Chamberlain, Craftsman and Genie enables us to supply brand-name replacement parts quickly. No job is too big or too small for our dedicated team of technicians. 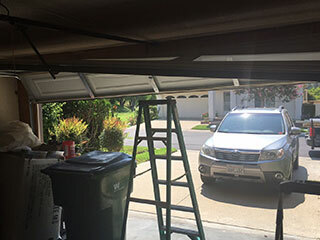 Whether you need an emergency same-day appointment to get your door working again, or your system just needs a little regular maintenance, our team at Garage Door Repair Greenwich is ready to help.